What is it like to live the life of a writer? They lead what some would call a double life. Ordinary, everyday citizen by day, writer by whatever spare time they have left. In fact, many have very successful careers outside of their writing. Take Maria Brandt, for example. Not only is one of her scripts (The Cell) featured in one of this year’s FONT readings, she is also a professor of English at Monroe Community College. This made me wonder, what are some of the things that go on inside her head, and how does she manage to juggle both a professional and a creative life? How would you describe The Cell without giving any spoilers? The Cell follows Lisa’s efforts to understand what happened to her family shortly after an environmental crisis hit their chicken farm when she was a child. Her sleuthing leads her to Harry and Rose, who are investigating possible criminal activity in relation to this crisis. Ultimately, both Lisa and Harry have to reconcile the intersections between their political beliefs, their broken families, and their attraction to each other. Before moving to Rochester, I served on the Artistic Board of The Bridge Theatre Company in Boston. That experience brought me into direct contact with all aspects of the production process. I dabbled in acting and design but found myself drawn most to directing and writing. My first short play was a finalist in the Boston Theatre Marathon and then produced by The Bridge as part of Personal Demons, an evening of shorts. My second short play brought me to the Last Frontier Theatre Conference in Alaska. After moving to Rochester, I got sidetracked with the demands of my job and parenthood, but about three years ago I returned to writing and haven’t stopped. What are some things you think about when writing? My thoughts are very active and focused in my non-writing life. When I write, though, that all stops and my mind becomes free. I’ve spent my life fascinated by people, in love with their complex depths, and versions of these people now appear to live inside me, waiting for the rest of my brain to shut down. They start talking, and I let them talk, and a story forms. Once the story forms, I sketch out a loose plot. This process helps me structure a narrative arc and begin building subtext. 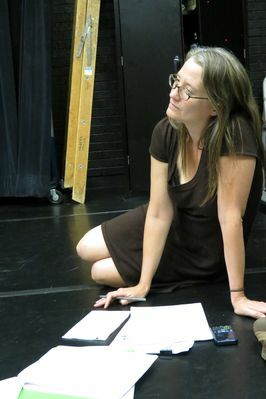 In addition to being a playwright, you are also a professor at Monroe Community College. Is it difficult for you to find time to write? How do you balance work and writing? It’s difficult for anyone to find time to write. We’re all so busy. But like everything else important in my life, I set aside that time. I also set incremental goals for myself. Once a play starts to form in my head, in addition to sketching out a loose plot, I establish a timeline for myself. This gives me small deadlines and keeps me moving forward. Eugene O’Neill remains my first love in terms of playwrights, though there’s a long list of others. In my personal life, my sister Emily is the one who brought me back to writing three years ago. She’s a poet in Brooklyn, and the two of us were having a hard time generating new work, so we challenged each other. 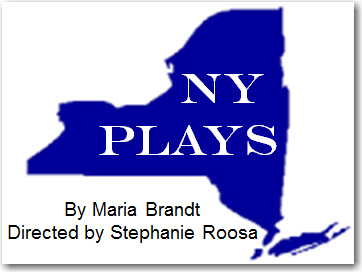 My New York Plays, just produced by Out of Pocket Productions at MuCCC, were the result of that challenge. They also were the result of my collaboration with Straw Mat Writers, a circle of women whose strength, talent, and friendship lift me every day. My greatest inspiration, though, is my son William, who is nine-years-old and has a fierce imagination, a love of numbers, and an ear for the music of words. He delights me and grounds me at the same time. What is the most exciting thing about theatre to you? When the lights go down before a play is about to begin, I always cry, even if the play is going to be a comedy. Magic happens when a whole group of individual human beings commit to imagining together. This is how we bridge the gaps between ourselves. This is how we understand each other. This is how we all begin to heal. I have to agree with her. There is a magic in the theatrical world, the type of magic that brings so many different people together to share in the same experience. If you compared the theatre to a magic show, the playwright would be the magician. It’s their words that bring everything together. Perhaps what makes it all the more magical is the fact that a writer, in fact, lives a life not all that different from anyone else’s.